Beautiful business card case in a noble design! Perfect for the elegant businessman! PP Business Card Holders-(120+120), 180, 240, 320, 480, Card's Capacity. Specially made and designed card and cd holders are available in different colours. These dual card holders can be customized as per the needs of the customer. 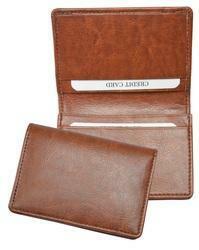 We are instrumental in providing our clients with a wide range of Brown Leather Card Holder. We are the leading entity of a wide range of Synthetic Leather Mini Bar Holder. Card Holder with very sleek and beautiful finish. Crafted with a combination of shiny steel and leather finish.